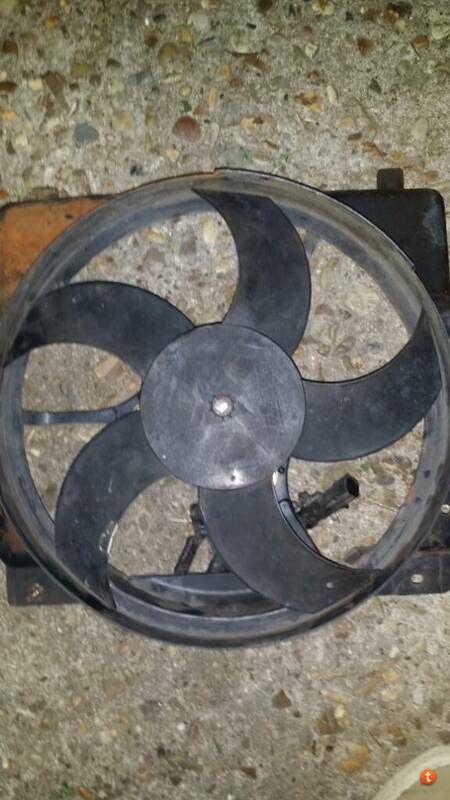 I have been wanting to dump the antiquated mechanical fan for a while now on my MJ, and have been looking at various "how-to's" on Dino's and Gojeep's websites, among others. 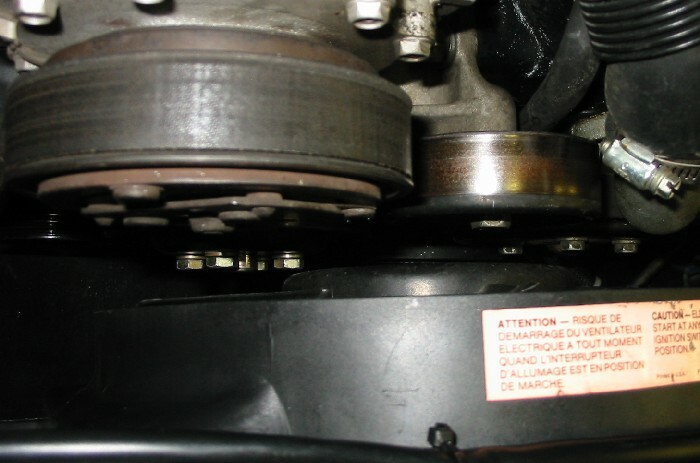 One criterion I had was that I wanted to keep it restorable if I ever wanted to go back to the mechanical fan, so I did not want to cut the existing mechanical pulley shaft as Gojeep did, which was necessary for clearance using the large 16" fans. After looking at various installs, I decided to go the route Slo-sho over on the NAXJA forum did and replace the mechanical fan with another XJ/MJ OEM electric aux fan, but with a few mods. These fans pull a lot of air for their size and I had a couple of spares readily available. 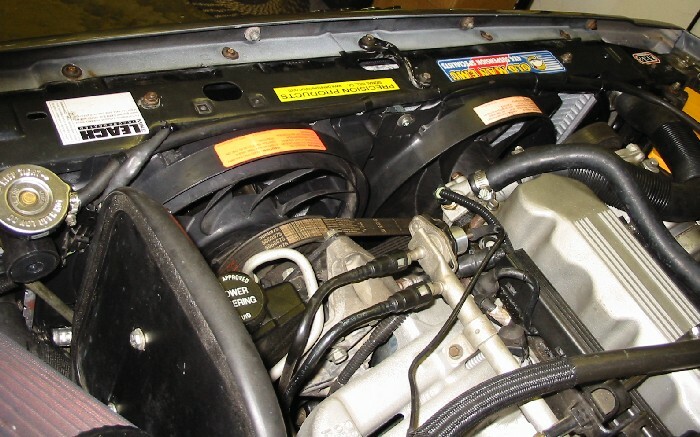 Step one of course is to remove the radiator and the old mechanical fan blade, shroud, and clutch. Then I replaced the fan pulley studs with 5/16" x 24 x 3/4" hex-head bolts. I used the bottom radiator brace for mounting the new fan. 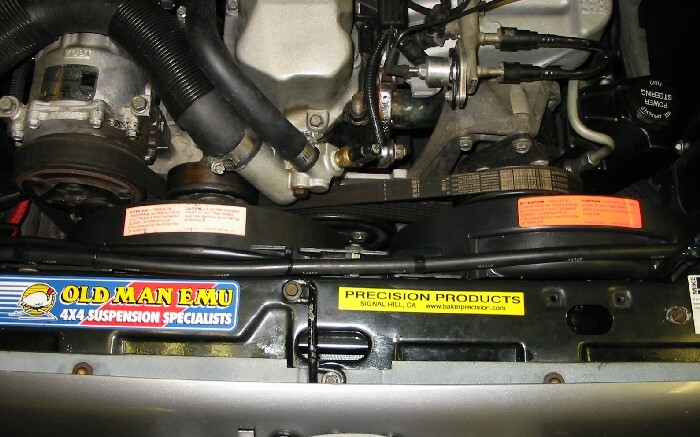 In the pic below, in order to make the new aux fan fit and clear the mechanical fan pulley, I had to Dremel two new slots in the radiator bottom support plate to move the fan closer to the radiator, and about 2" toward the driver's side so the fan blade head would clear the pulley bolts better. Here's a rear view of the two electric fans. I used a Spal PWM-V1 variable speed controller to independently control the new fan, which is now my primary cooling fan. For temperature sensing input to the Spal controller I used the existing dash gauge thermister located at the left rear of the cylinder head. 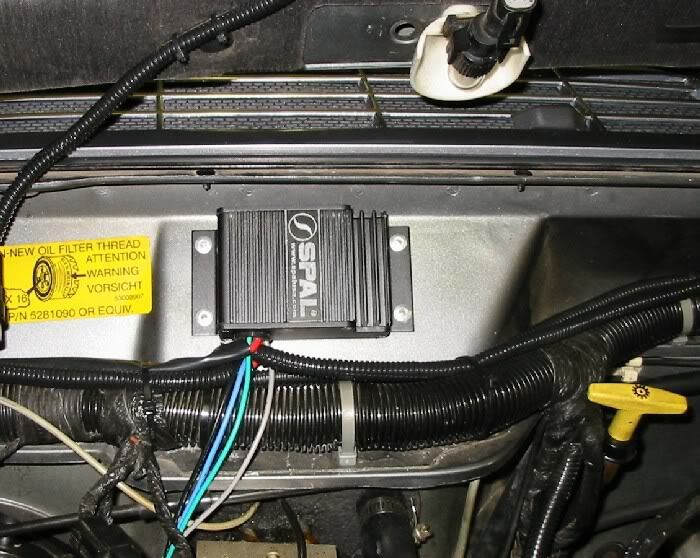 I first tried the ECU temp sensor on the thermostat cover, but the gauge sensor on the head provided a larger voltage delta betweem the Spal LO and HI fan speed settings and gave more precise fan speed-switching control than the one on the thermostat cover. I set the LO speed to come on a 190*, and the HI speed at 215*. So far these settings are working fine, with the new fan staying on LO most of the time. The existing aux fan still operates as always, ON with the A/C or when the temp reaches 220* or so. But I did want redundancy just in case, so I wired in a dash switch so I could manually turn on the aux fan if the new primary fan went belly-up. So far all is well, the new fan runs 90% of the time in LO, only coming on HI speed when stuck in traffic for some time. The existing aux fan has never come on (except when I run the A/C of course). I also have noticed a mile or two increase in MPG on the stroker too, which is always good. The engine seems to spool up faster too because it's not pulling the old mechanical fan, but this may be my imagination. Hope this helps someone who is considering doing this mod. Mind if I ask how much just the SPAL controller cost and where you got it? about to do this mod and was wondering if it worked out as well as you had hoped. any trouble keeping things cool. anything you would have done differently? It's still there and working great. No problems. The worst situation for me is getting stuck in traffic on a 100* day, and sometimes I need to have both fans on until I get rolling again. Of course there is more electrical load then, so a bigger alternator is better. Not mandatory but better. Decided to replace the old radiator with the new FFD radiator I picked up. 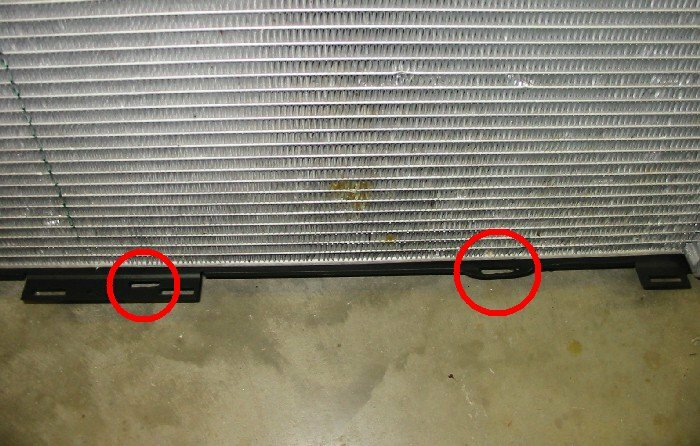 The old radiator worked fine, but had the plastic side tanks and wanted a quality all-metal rad for better heat transfer. Here's the new radiator I got; a solid dual core all metal that I've read good things about. It all fits in there well as the old rad did with plenty of clearance from the mechanical fan pulley even though this radiator is about 1/4" thicker. Haven't had time yet to completely evaluate it long term yet, but I did go for a 20 mile drive in traffic in the 90* heat and it cooled better than the old system with only one fan running at low speed. How would I wire a switch in to manually turn the fans on? Also, how did you get the hex head pulley bolts out to replace them? 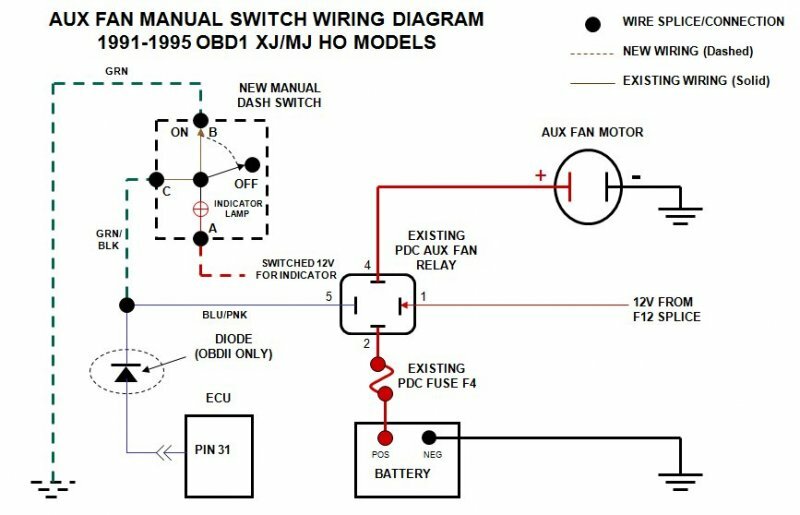 I'm going to convert my 89 to the new system with a basic radiator (hopefully the FFD later) and am going to run electric fans..
Do you happen to know the amperage draw for the stock 99+ fans? This is a very smart article. They are fused in the 99 and up XJs at 30A each. I have mine fused at 25A/ea with no problems. They usually pull 17A-22A at startup and run out at 10A-13A. Today I was replacing one of my fans that went out, done this mod awhile back BTW been working awesome . Noticed the one that I snagged from the JY out of a 97 XJ had 8 blades instead of 10 like the other I have, both have Chrysler marks. Wondering when this change took place to the 10 blade and is the cfm lower on the 8 blade. Looked back at your thread and noticed you also have an 8 blade. I have two 10-bladers in now. As far as the year they changed from 8 to 10 blades, not sure. From 97 - 01 there were three separate part numbers used, and I don't know the difference between them. There's a thread on NAXJA somewhere posted by a guy who sells a 3-fan aftermarket conversion kit and he did some CFM measurements. 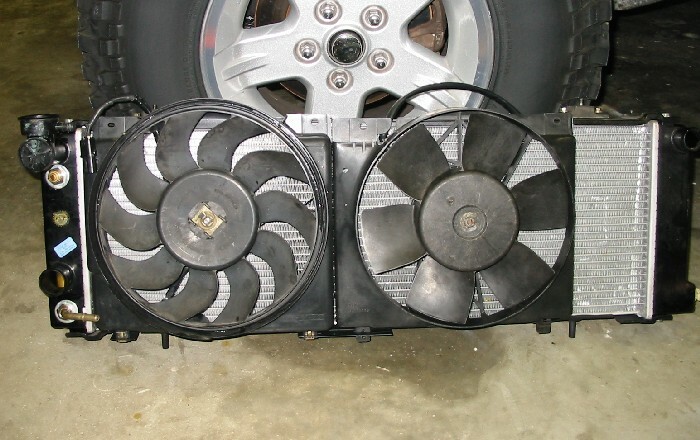 According to him, two 10-blade XJ fans pulled more air than the 3-fan rig he was selling. He justified buying his kit though by claiming that the two XJ fans pulled more amps than his 3-fan kit did. :dunno: So what? I'll take more CFM any day. Oh okay just seen you had the 5 blade then the 8 blade in the last pic how did the 8 blade perform? Well damn, think I'll do this on the MJ, although I only have a 92 and a 94 fan in my spares list. Although I might pull my 00 fan and swap it for the 94 and run it as the main fan and use the 92 as a secondary ... XJ fan never runs anyway (No A/C (oba) and a cool running motor due to new/maintained cooling system). The motor runs at whatever temp I toss in for a thermostat since I converted to a 2000 XJ rad (my old stock rad after a re&re on the 00 ). Being a manual she runs cool as a cucumber anyway. Might as well let a few ponies out. Might need to upgrade the stock alt though, pretty sure is a measly 60A and tired at that. Always wondered about this one, nice.